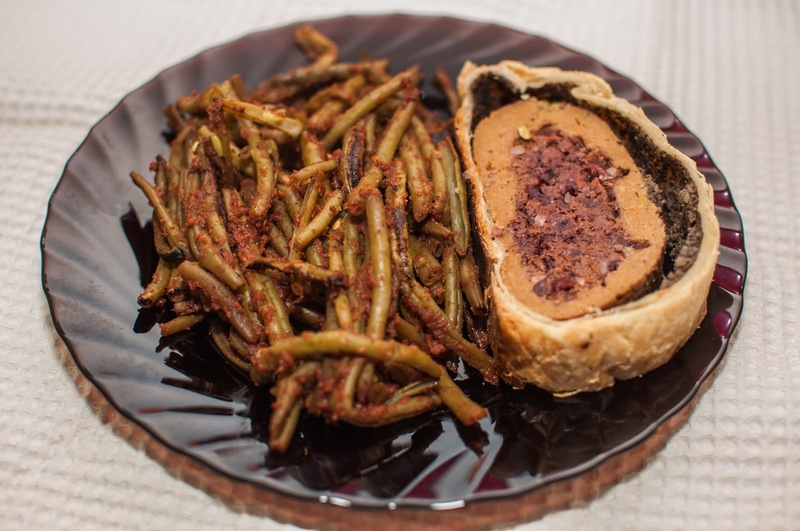 I really love the idea of a wellington, but traditionally it's made with a lot of cruelty (meat and eggs and stuff like that), so I'll never make a traditional one. But hey! we have seitan, so I made a seitan wellington. 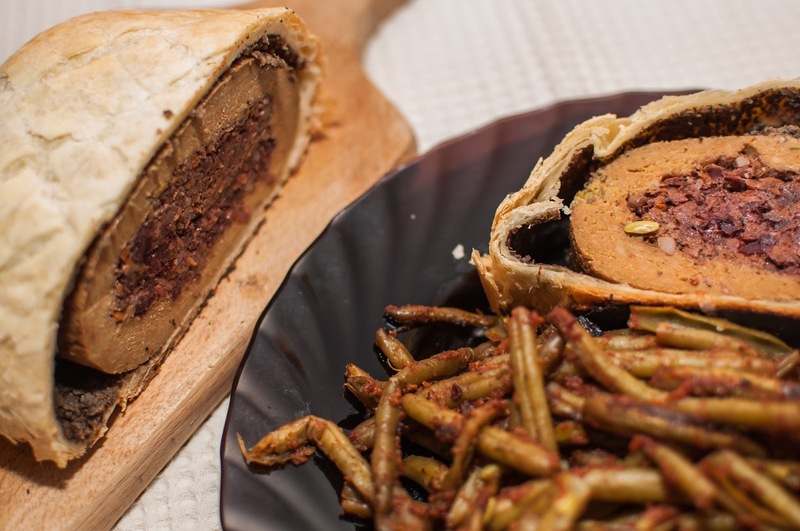 And because I like to make things different, I made a stuffed seitan wellington, with a sweet and savory stuffing with cranberries and walnuts that is amazing! And really festive! Only talking about this my mouth is watering! Guys, I have to let you in on a secret! 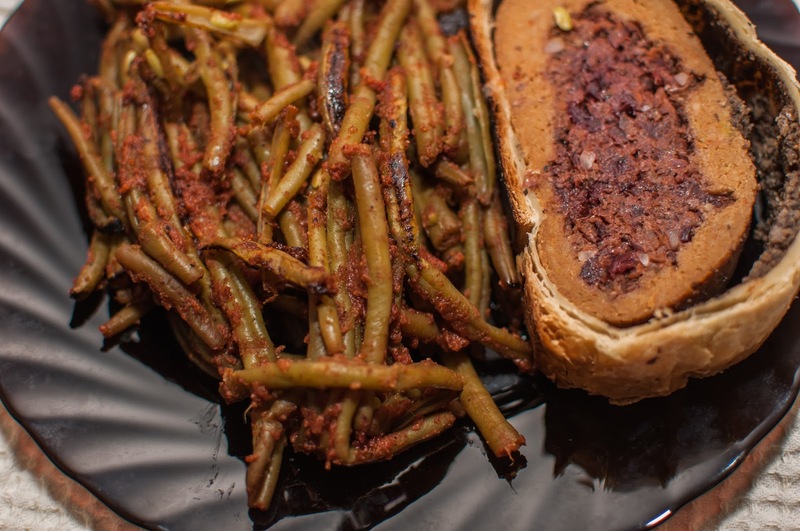 This is the recipe that I worked the most on from this entire "Vegan Holidays" series... But I think that it was worth it! Let's go to the recipe, and keep in mind that it's a little bit more lengthy than usual. For the stuffing chop all your vegetables and crush the walnuts. I prefer to throw all the vegetables in a food processor and pulse until finely chopped, not pulverized. You still want some texture. Wipe the food processor and throw in the walnuts and cranberries. Process those until the walnuts are a little bit smaller than the cranberries. In a little bit of water cook your vegetables until they start to soften. Add the spices, the flax egg and the chopped walnuts and cranberries. Add some more water if needed. Cook a little bit more stirring often until everything is cooked and a little dry. Add all the dry ingredients in a bowl and mix until well combined, then add everything else beside the water (or vegetable stock) and mix until well combined. Add the water or stock little by little and knead well until you reach the desired consistency. When you reach your desired consistency knead your seitan well for at least 5 minutes to activate the gluten. Wrap it tightly in clingfilm, tie it at the ends and cook it in the oven, in a deep dish, covered with water (or on the stove) for about 1 hour. Take it out, unwrap it and let it cool. You can eat it like that or make my stuffed wellington. Clean your mushrooms thoroughly with a wet paper towel. Chop them finely or throw in a food processor and blend until fine, but not pulverized. 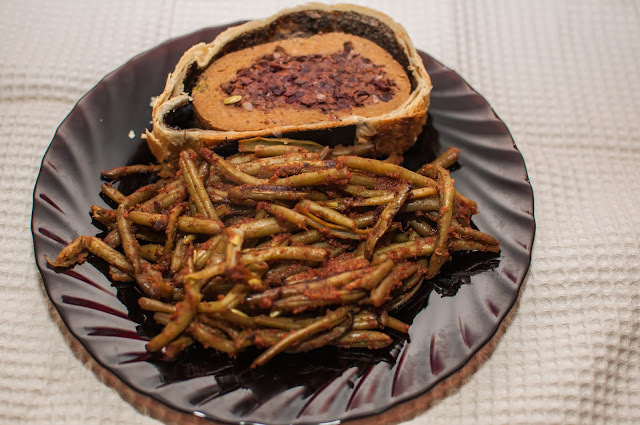 When the mushrooms begin to release their juices, continue to cook over a high heat for about 10 minutes until all the excess moisture has evaporated and you are left with a mushroom paste (known as a duxelle, according to Gordon Ramsay). Remove the duxelle from the pan and leave to cool. Roll the puff pastry until it reaches the desired size to cover your seitan. 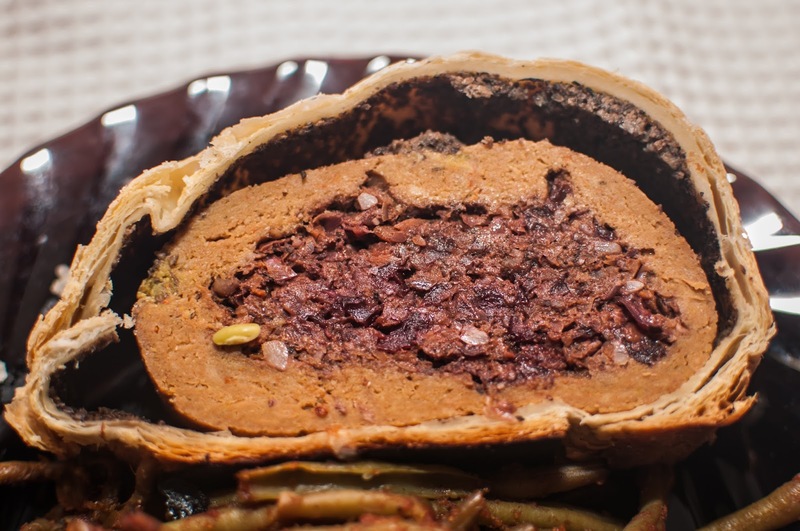 Spread the duxelle onto your pastry, then wrap tightly your stuffed seitan in it, overlapping a little in the middle. Trim the ends. Place your wellington in a baking dish with the overlapping side on the bottom. Score lightly on the top side. Bake for 25-30 minutes on medium heat until the pastry is golden brown a cooked. Rest for about 10 minutes before cutting. Enjoy with a red wine sauce or your favorite gravy.